The Indians, especially the back-four of captain Sandesh Jhingan, Narayan Das, Pritam Kotal and Subhasish Bose, played their hearts out to held their nerves till the end. 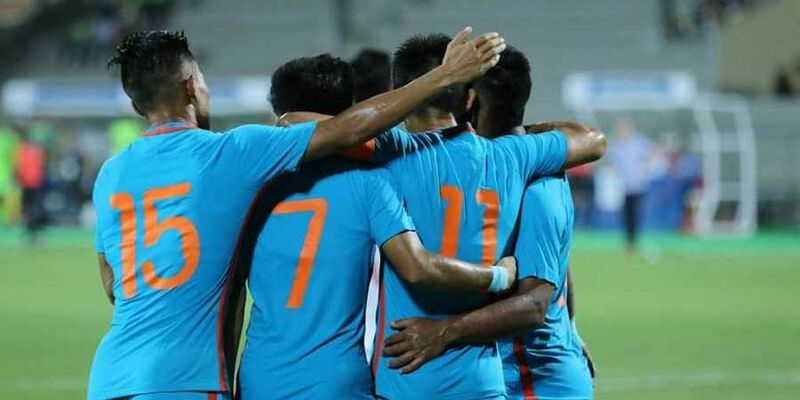 SUZHOU: A gritty India thwarted a wave of Chinese onslaughts to play out a remarkable goal-less draw in an international football friendly played for the first time after 21 years between the two countries here Saturday. Chinese forwards' goal drought continued while the Indians, especially the back-four of captain Sandesh Jhingan, Narayan Das, Pritam Kotal and Subhasish Bose, played their hearts out to held their nerves till the end. The home side had at least three clear chances with two being denied by the woodwork while their star striker Gao Lin failed to find the target several times. Captain @SandeshJhingan makes a fantastic clearance. Custodian Gurpreet Singh Sandhu stood like a rock in front of the Indian goal as he denied the home side at least on four occasions. India were playing on the Chinese soil for the first time and there were periods in the match, though few and far between when the visitors threatened on the counters. The draw is also expected to take India higher in the FIFA rankings. They are now placed 97th while China are at 76th spot. China had lost to an inexperienced Qatar team 0-1 last month before playing out a 0-0 draw against Bahrain. They have not scored since beating Thailand 2-0 in June. But the visitors did not give an inch to the Chinese attackers who has played more than 100 international matches, for the most part while goalie Gurpreet made a few fine saves. In the seventh minute itself, the Indian goal was under threat but Jinghan made a timely clearance for a corner following Yu Dabao's shot. The Indians grew in confidence as the match wore on and they even had a very good chance in the 13th minute when Sunil Chhetri passed the ball back to Pranoy Halder who went diagonally to Anirudh Thapa who, in turn, laid it for an onrushing Kotal. But Kotal's right footer from the right side of the box was parried away by Chinese goalie Yan Junling. That was the best chance India had in the first half. Two minutes later, Gao had a free header from a corner but the ball went directly to Gurpreet's hands. India got a free kick in the 17th minute and Thapa's delivery found an unmarked Chhetri making a first time shot but the ball sailed over. As soon as the second half began, Gao rattled Gurpreet's crossbar in the 48th minute but a few minutes later Udanta Singh was set up by Holicharan Narzary but the Manipuri shot over the crossbar in a hurry. Before Saturday, India and China had played 17 times with the last one being in 1997 in Kochi. China had won 12 times while the remaining five were drawn matches.